Cabbage is a staple of much traditional Pennsylvania German and Amish cooking. 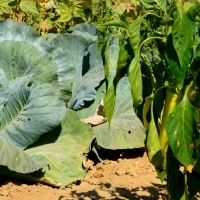 The cabbage comes in numerous varieties including green, white (Dutch), Savoy, and red. Amish recipes based on the cabbage include cabbage rolls, cabbage casserole, and sweet-and-sour cabbage. Sauerkraut is a pickled cabbage also popular in Amish cooking. Share your Amish Cabbage Recipes here. Combine beef, salt and pepper, rice and egg. Mix well. To make cabbage roll sauce: Saute the chopped onion in butter until soft. Add equal amounts of tomato soup and water to the chopped onion. Add parsley, celery, sugar, salt, pepper and lemon juice. Cook for 10 minutes. Wash the cabbage leaves and boil them until tender. Place equal quantities of the meat mix into each cabbage leave. Roll leaves tightly; secure with toothpicks. Place cabbage rolls into the sauce pan. Pour sauce over cabbage rolls. Cover pan; cook very slowly (3 hours). Shred cabbage rather finely. Place shredded cabbage into a sauce pan. Sprinkle with salt. Cover pan. Cook over low heat, steaming cabbage until soft. Beat the egg. Add the vinegar, salt, and sugar. Pour over the steamed cabbage. Heat for five minutes and it’s ready to serve. Bring the milk to a boil. Add chopped cabbage and butter. Cook for seven minutes. Thicken the mixture with flour combined with a little cold water. Place 4 tablespoons of bacon grease into a pressure cooker. Chop fine 1 small onion in grease. Brown onion to a golden brown color. Shred a 2½ lb. head of red cabbage. Mix ¼ cup of vinegar with ¼ cup of water and 2 tablespoons of sugar. Put the cabbage into the onion and grease. Pour the mixture of vinegar and sugar onto the cabbage. Season with salt and pepper to taste. Mix lightly. Divide 1 large pared apple into quarters. Put apple quarters on top of the cabbage. Cook for four minutes. If using an ordinary pot you should cook for 20 minutes. This recipe will make 10 servings. Share your Amish Cabbage Recipes in the Comment Box below! Please type recipe title (ie, “Amish Baked Cabbage”) in the “Comment Title” box. I made this last week, & I LOVE it! I’m making an alternate another double batch tonight! Yummmmmmm.. This is not a comment but a question. Years ago at a friend’s house for dinner his mother cooked a meal of Egg Noodles, shredded cabbage, polish sausage. There was also Fennel seeds in it, I am sure there was other things like butter, and spices, but I do not have the recipe and sadly that dear lady is passed away now. Can you possible help me to figure out what might have been in this recipe, it was so good. I know she baked it in the oven before serving it, as she brought it right out of the oven to the table. I hope you have some suggestions as to how I could recreate this recipe. It sounds similar to something I make using Bavarian Style Sauerkraut (that has fennel seeds in it). Place sauerkraut in bottom of casserole, slice up sausage and place on top. Bake 35 minutes or so. Maybe trying this will help you zone into the flavors you remember! My mother used to make this using milk instead of water. I remember she had to take care that it didn’t curdle with the vinegar. I don’t have her recipe, but I can still taste it, even though I have not had it in over 55 years. She made it a heavy black frying pan. Does anyone have a recipe for this? I have the ingrediates I need but I don’t have how to put it together . Do I bake or on top of stove?